Don't want to put your pooch in kennels? We offer care in our family home while you're away. As we intend this to be a home from home experience we intend to board no more than up to 4 pets at any one depending on breed and temperament. We hold Public Liability, Care, custody and control insurance and are licensed by Northumbria County Council. We will take up to 4 large breeds or up to 4 small breeds and they will be cared for in our home as part of our family for the duration of their stay. All your pets needs will be discussed before their stay and we will keep to their normal feeding and exercise routines. Your pets vacinations should be up to date and we would ask that they are treated for fleas and worms before their stay and details of any medication they are taking. Please see our web site for further information. A non refundable deposit of 20% of the total cost of the stay is required to secure booking or a minimum deposit £20 whichever is the greater. The balance of payment will be due no less than 14 days prior to your pets stay. Payment can be made by cash, cheque or internet banking. If paying by cheque please make payment 21 days prior to the stay to enable the cheque to clear. Payment for stays with less than 14 days notice will be payable immediately. Charges are per day or part of. We would prefer that you drop off and collect your pets personally at pre argeed times. Wish you were here! Sun, sand,sea and is that sausages? Pip and Archie had a great time with Mary and slept really well after all the fun they had. Mary even took the time to send us a Christmas video of them which I found very thoughtful and while we were on holiday she kept us up to date with what they were doing by sending us photos. Lynne & Richard did a great job of looking after Gretel Not sure she was bothered about coming home. She keeps asking when our next holiday is! We will definitely use Hounds on Holidays again if Richard and Lynne are available. As usual an excellent service from Hounds on Holiday, Max and Oscar have had a great time with both Mary, Lynne and Richard and there last visit was with David. He could not have made them feel more welcome, I think he had just about surrendered his home to them listening to the way they had been treated. There was some great video of them out enjoying themselves, I would without hesitation recommend hounds on holiday and we are just looking to book Max and Oscars holiday there again this year. I left Buddy for the first time recently in David's care and he had a great time. Buddy was very happy to be in David's company instantly which reassured me that he would be looked after very well. I will be sure to use hounds on holiday again! Excellent service. Our dog stayed with one of Mary's hosts, David We will have no hesitation in using Hounds on Holiday again. Leaving our two rescue Greyhounds was a huge decision as we usually take them on holiday with us, we needn't have worried Mary was really helpful from the start and once Ned and Kes had met host family David they all got on famously, Kes who is quite nervous took to David straight away and David kept their routine the same as at home, the dogs seemed to have had a great holiday ------ and so did we. In the past have used boarding kennels but as my Golden Labrador 'Amber' is 13 now, did not want to stress her in a noisy kennel environment, so after an initial internet search came across 'Hounds on Holiday' via findpetboarding.com. From my initial contact with Mary the organiser & subsequently visiting our Host Family Andrew & Amanda's dog friendly home with their lovely cocker spaniel 'Henry' for an initial meet & greet visit. We had no reservations about leaving Amber for 3 days while we attended our son's graduation. When we returned to pick up Amber, although obviously pleased to see us, you could tell that she had enjoyed her stay by the way she still interacted with Andrew, Amanda & of course Henry. I would not hesitate to use 'Hounds on Holiday' again & hopefully Andrew & Amanda as my dog's carers. My dog spent two weeks with Lynn and Richard. They also had an old Lab staying at the same time and the two dogs got on very well together despite the age difference. My dog was well-looked after and seemed quite happy when he came home. He still looks wistfully at their house when we pass on our walks. That they live so near to me if a bonus, he's in familiar surroundings and in a dog friendly home. Couldn't get much better than this. From our initial contact with Mary and then meeting Lynne and Richard in their lovely home we knew we had found the right people to look after Trampus. They are wonderful people who love dogs and give you the confidence that your pet will be part of their family and well looked after in a home environment. Tramp also agrees, a very happy boy who will be more than happy to go back and stay, thank you very much. 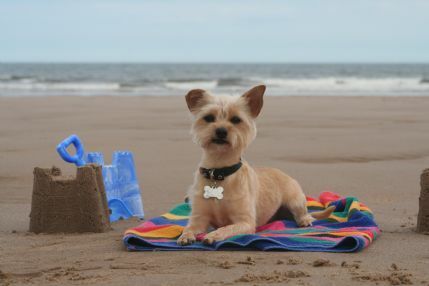 Having met Andrew, Amanda and their dog Henry before leaving our Yorkshire terrier with them for 2 weeks, I felt confident that Smudge would be well looked after in a home from home environment. Smudge did indeed have a loving, fun and comfortable stay and although pleased to see us on our return, definitely missed them for a day or two! I would not hesitate to recommend Hounds on Holiday and will definitely be using them again when we next go on holiday, as it means we can enjoy a worry free break knowing that Smudge is being cared for just as she would be at home. Our Chow-Tsu dogs, Merlin and Meimei, love going to Hounds on Holiday. 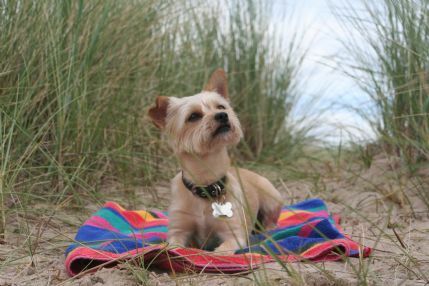 We don't worry when we are going away because we know our precious pets are having a great holiday themselves, often going to the beach and playing in the woods. They are cared for by real dog lovers and they always come home happy and in great condition. Highly recommended! We left our dog Alfie with some trepidation as we had never left him before, we need not have worried. Mary was very friendly and clearly cares about her charges. The garden is a safe haven for the animals. The cost was very reasonable knowing he was being loooked after in the home and not in a kennel. Alfie returned to us a very happy dog I would have no worries about leaving him in the future and would not hesitate to recommend. We are situated in Widdrington Station, a village approximately 5 miles north of Morpeth. Please see our website for details of availabily.